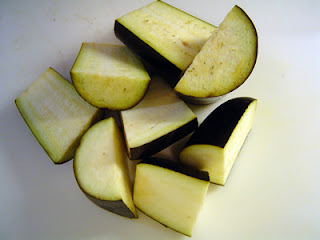 Cut the baigan into big pieces and boil them till soft. After they have cooled, gently take out the peals from the baigan pieces. 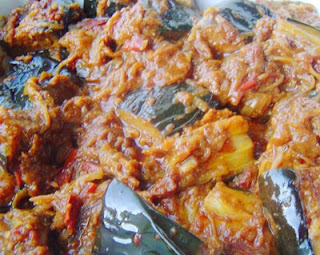 You may peel the baigan before boil them to make it easier for you. If the baigan are very fresh you may not peel them at all. 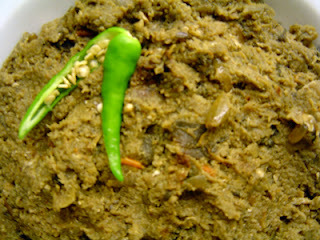 Mash the baigan well and leave aside. Chop the oninons and the tomatoes. Heat the oil in a pan and add the onions. Fry till translucent. Add the jeera, dhania and the red chillie powder. Add a little water and fry the masala. Now add the tomatoes and a bit of salt. Adding of the salt will soften the tomatoes quickly and allow it to mix with the masala well. Cook this for some more time till oil starts to leave the sides. Add the baigan and the remaining salt according to your laste. Stiring continuosly, cook till the water from the baigan evaporates. Now add the egg and mix it well. Continue to stir till the egg gets cooked well and it’s fully blended into the baigan. Also you should ensure that the water has fully evaporated. Now remove from heat and serve hot with steamed rice or roti. *Strict vegetarians, may omit adding the egg. Wash and cut the baigan into big pieces (about 12 per baigan). Finely slice the onion and chop the tomato. Heat oil and fry the baigan till they are lightly brown and soft. Press lightly ans squeeze out the oil from the baigan before removing them from the pan. Leave the fried baigan aside. In the same oil, add the chopped onion and fry till they have softened. Add the ginger garlic paste and fry them along with the onion for about 2-3 mins. Now add the powdered masala, stir and add a little water. Fry the masala till oil separated and the water is fully dry. Now add some water again and repeat the process for frying the masala. Once again when oil starts to separate, add the chopped tomatoes and salt according to taste. Now add the fried baigan and stir so that the gravy is mixed well with the baigan pieces. Add about ½ cup water and cover the pan. Simmer and cook for about 2-3 mins. Uncover, and increase the heat to maximum and let the water (if any) evaporate fully. Once the oil starts appearing at the sides and the gravy is almost dry remove the baigan from the heat. Serve hot with roti/paratha or any rice of your choice.